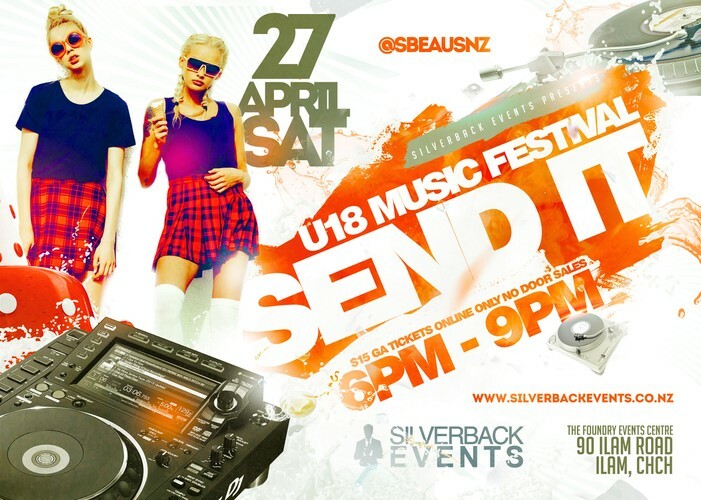 Christchurch Largest Under 18 Festival of 2019. With capacity of 1000, for 3 hours, we are setting up your year to be massive. DJs from around the world will be tearing the place up all while you gather in your squads. There will be food available for purchase + soft drinks, energy drinks & Free Water. No door sales, so please make sure your phone is charged so we can check you in or print out your ticket before you come. Tickets and capacity is first in, first served. Make sure if you are or look 14 or 15, you have I.D (Passport, school I.D or some mates to vouch for you). Under 14 (on the date of the event) will not be allowed within the venue but we hope to see you next year! Over 18 years old will not be allowed within Venue. Transport to & from the festival will be setup throughout Christchurch but, buses will be limited. (We advise getting your mates to drive or Parents / Uber) Buses released at a later date. This Festival is controlled by Professionals / Security so, don't think you can play up or bring Alcohol, Security will deny you access and will be checking throughout the event. We might also tell your parents. You are at a concert and people will want to get up and dance and may block your view. If you are confined to a chair please contact us as we will have a designated area for those unable to stand. Come join us and Send It!